Bingoweb.ga is a browser hijacker that can replace your main browser settings without your notice. It spreads with the help of free third party software. It is possible that along with the hijacker you also acquired other potentially unwanted programs. The main aim of the hijacker is to promote its sponsors and thus generate revenue for its developers. That is why it will alter your preferences, flood you with advertising data, reroute you to various sites, and more. Keep in mind that that hijacker is compatible with all most commonly used web browsers. If you want to eliminate its symptoms and go back to uninterrupted and safe Internet browsing, you will have to get rid of Bingoweb.ga. As it has already been mentioned, Bingoweb.ga spreads with the help of freeware and shareware bundles. You need to know that free software is often accompanied by additional programs, which are usually not very useful. If you want to avoid them, you should select Advanced installation mode, whenever you can, and decline all optional offers. 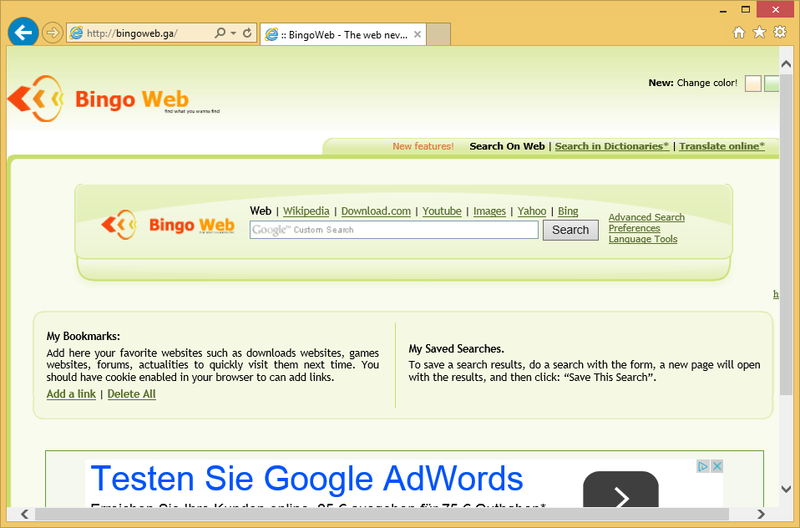 Once the hijacker takes over, it will change your home page and default search provider to Bingoweb.ga. This site does not look trustworthy at all. It contains a search box, My bookmarks and My Saved Searches sections, and a suspicious advert. We do not recommend making use of this page, or the search box that it presents you with. If you search the Web with this engine, you will be presented with results that will contain sponsored links. We advise that you go back to your original search tools. To do that, you will have to terminate Bingoweb.ga. Other symptoms that you are likely to notice after the installation of the hijacker mostly have to do with advertisements. They will appear everywhere you go online. Some of these ads will be fake and if you click on them, you will risk infecting your PC with malicious programs or falling for other scams. You may also experience redirects and Internet slow downs. There is no reason for you to hesitate with Bingoweb.ga removal. There are two options you can choose from in order to delete Bingoweb.ga from your browsers. One of them is to erase the hijacker manually by uninstalling its related software and restoring your browser settings. Alternatively, you can eliminate Bingoweb.ga automatically. This can be done with the help of the malware removal and prevention tool presented on our page. The anti-malware utility will perform a system scan and detect all issues. It will then erase Bingoweb.ga along with other detected threats. The security software will also stay useful in the future as it will provide you with real-time online protection.